Are there other worlds like ours? Is there a design for the universe, or is it simply the result of random chances raised to the billion-billion-billion-billionth power in some cosmic roll of the dice? There are scientists of all stripes on both sides of this divide. Both sides can make elegant and impassioned arguments to support their positions. The old paradigm of science vs. religion basically required that you had to choose one side or the other. Either you could check the weather forecast or pray for rain. Either you could believe that everything happens by the uncaring forces of random chance. Or, you could believe in divine providence. In the old “normal-space” view of the universe, we were bound by the three dimensions of space plus one of time. We lived in a series of boxes divided by walls, floors and ceilings representing height, width and depth. Anything that did not fit into such three-dimensional boxes was simply not part of the normal-space universe and could be ignored. But the three dimensions of normal-space could never capture all that was happening. For example, Chinese acupuncture seems to have no medical connection to our physiology. Perhaps a better way of stating that is that western medicine cannot make that connection. And yet acupuncture seems to be providing health, strength and vitality to its adherents. The skeptic could say that any benefit derived from acupuncture could be purely delusional, caused by wishful thinking or caused by the placebo effect. But let’s not be hasty. Acupuncture involves the flow of a special energy called “qi “, which travels along meridians of the body. But these supposed meridians appear on any western anatomy charts. The literal translation of qi is wind, breath or gas but is often translated as life force. The equivalent word in New Testament Greek is pneuma, which means air or breath but is usually translated as spirit. Visualizing String Theory requires the ability to think in paradox, where two seemingly contradictory ideas can be held together with a sense of deeper harmony. Paradoxical thinking requires a more expansive view of the universe than does our ordinary normal-space existence with its notion of certainty. Perhaps there is some efficacy to acupuncture, even if western medicine cannot understand it. This is neither to support nor deny acupuncture, but only to suggest that there is more going on in the universe than we can comprehend with our limited, normal-space thinking. Perhaps the extra dimensions in String Theory give us the space to allow for dimensions of existence that we have previously thought of as magical, mystical, spiritual or religious. And, here is a radical thought. 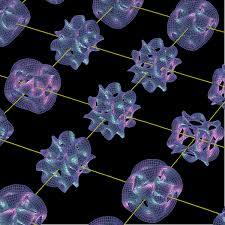 Perhaps String Theory not only allows for the mystical, but perhaps even requires it. Energy conduits enter our homes to provide radio signals, electricity, clean water, natural gas, telephone service, Internet access, and a host of other connections to the outside world. These special conduits or channels enormously affect the normal-space boxes in which we live, and provide a host of special powers that would have been seen as miraculous even a few hundred years ago. This analogy may help us to explore the extra dimensions of String Theory. Perhaps one of the String Theory extra dimensions is a channel for qi, a force that we cannot access until we understand it. As a Christian, and more specifically a Calvinist, I have always found the universe to be a sacred place filled with divine logos. “Logo” is Greek for “word” in standard New Testament usage. But it means more than just the spoken word. It also means order, pattern, or design. When we speak of divine logos, we are speaking about the divine order that pervades all things. It covers the birth of the universe, the mating habits of tsetse flies, the DNA molecule, the Van Allen radiation belts, the formation of the planets, and the life cycles of stars. To perceive the divine logos in all things is to live in a spiritual dimension. And now, String Theory may allow such a metaphysical statement to be incorporated into an expanded view of the universe. Perhaps there is actually in the physical universe a place beyond normal-space where spirit dwells. Paradoxes are common in both cosmology and in theology. Indeed, this shared quality demonstrates how these two seemingly diverse endeavors are really quite similar, if not two sides of the same coin. A photon can act like either a wave or a particle depending on what is being tested, or what question is being asked. Relativity and Quantum Mechanics both are needed to describe the universe, and yet these two views of the cosmos cannot live together in harmony. Relativity describes the very large, while Quantum Mechanics describes the very small. These theories clash in such arenas as black holes, where very large massed converge in very small spaces causing the mathematics to break down. Matter can be thought of as frozen or congealed energy. The rock in your hand feels solid and permanent, but is really only a lump of frozen energy. And it is not permanent at all, but ephemeral. One common understanding of dark energy is that all atoms will be eventually ripped apart and normal, baryonic matter will be no more. The speed of light is the cosmic speed limit, except that this speed limit does not exist for space itself. The theory of Inflation, first proposed by Alan Guth, requires that at the Big Bang space expanded vastly faster than the speed of light. This means that the universe is vastly larger than our horizon. We can see 13.5 billion light years in any direction, because that is the age of the universe and is as far back in time as we can see. But if we could stand at that horizon, we could see an additional 13.5 billion years further on. Our Universe seems to be paradoxically both bounded and boundless. Even our Universe may not be all that there is. String Theory and M (or ‘Brane) theory suggest that our Universe is not alone. Rather, the image of our Universe is more like one soap-bubble among countless others. Theology is impossible without paradoxical thinking. Jesus is fully human and fully divine. Unless a believer can fully hold to these paradoxical understandings then they have not understood the incarnation and what it means. The Holy Bible was written over some 1,400 years by hundreds of human hands. They represent many different viewpoints and cultural epochs. They record the spiritual saga of the Jews and the early Christians, written from a human perspective. And yet somehow there is divine inspiration to be found within. principles, known and unknown. And yet somehow it was created by God and filled with God’s logos, or divine order that permeates all things. A good example of this divine logos is the concept of fractals. Fractal math describes how large items can be structured by simple repeating patterns. The architecture of a leaf is a fractal pattern with cells and veins growing out of the repetition of simple patterns. The arrangement of the limbs and branches of a tree are also derived from fractal patterns. 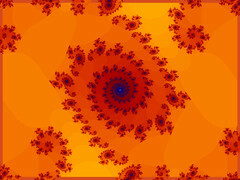 Fractal patterns can create vast and elegant constructions from a few simple codes. This coding can be computer code or DNA. Coastal redwood trees can grow to over 360 feet in height. One of the joys of living in Northern California is walking through forests of these giant trees that grow to form living cathedrals. And yet, through the miracle of fractal algorithms, the seeds of these magnificent trees are no bigger than a grain of rice. John Calvin, the founder of the Reformed Tradition, wrote that to study the creation is to study the creator. His words provided the theological foundation for all of modern science. Cosmology links science and theology. We live in a Universe that is beyond all comprehension. And yet, the paradox is that we can learn to comprehend it. And that might be the ultimate paradox.